The Free State of Saxony -(Freistaat Sachsen) is a state of Germany, located in the southeastern part of present-day Germany. It is the tenth-largest German state in area (18,413 km²) and the sixth largest in population (4.3 million), of Germany's sixteen states. Located in the historical heart of German-speaking Europe, the history of the state of Saxony spans more than a millennium. It has been a medieval duchy, an electorate of the Holy Roman Empire, a kingdom and, since 1918, a republic. The area of the modern state of Saxony should not be confused with Old Saxony, the area inhabited by Saxons. Old Saxony corresponds approximately to the modern German states of Lower Saxony, Saxony-Anhalt and North Rhine-Westphalia. 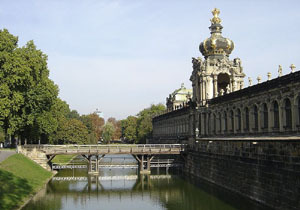 Except for Dresden and perhaps Leipzig, Saxony is not known as a primary destination for foreign tourists. Areas along the border with the Czech Republic, such as the Lusatian Mountains, Ore Mountains, Saxon Switzerland, and Vogtland, attract significant visitors, largely Germans. Saxony has well preserved historic towns such as Meissen, Freiberg, Pirna, Bautzen, and Görlitz. World renown cultural locales as Dresden's Semper Opera, the Gewandhaus in Leipzig and the outstanding Opera in Chemnitz are great offerings of Saxony. This is also an area offering visitors vast number of castles, palaces, museums, festivals and exhibitions. The southern section of this federal state's reputation of "Musicians Corner" boasts world wide virtuosos have played from instruments created in this part of the world since 1677. The specific area of Saxony's Vogland is homeland for artisans and master craftsmen who have built string and wind instruments. Plauen, a city known for filigree-type beautiful lace, prides itself for exceptional artists creating this world famous fabric. At the Lake Museum one can attend embroidery workshops, witness lace making and embroidery made on traditional looms and early machines. The Soviet Union set up the communist government of the German Democratic Republic in 1949, with Saxony a part of it, giving the USSR a satellite in the heart of Europe. The communist government officially dissolved the Free State in 1952, and divided it into the three smaller Bezirke of Leipzig, Dresden, and Karl-Marx-Stadt. The Free State was reconstituted with slightly altered borders in 1990 upon German reunification. Besides the formerly Silesian area of Saxony, which was mostly included in the territory of the new Saxon state, the free state gained further areas north of Leipzig, which belonged to Saxony-Anhalt until 1952. Dresden is the capital city of the Free State of Saxony in Germany. It is situated in a valley on the River Elbe, near the Czech border. The Dresden conurbation is part of the Saxon Triangle metropolitan area. Dresden has a long history as the capital and royal residence for the Electors and Kings of Saxony, who for centuries furnished the city with cultural and artistic splendor. The city was completely destroyed by the controversial Allied aerial bombing towards the end of World War II. The impact of the bombing and 40 years of urban development during the East German socialist era have considerably changed the face of the city. Some restoration work has helped to reconstruct parts of the historic inner city, including the Katholische Hofkirche, the Semperoper and the Dresdner Frauenkirche. Since the German reunification in 1990, Dresden has regained importance as one of the cultural, educational, political and economic centers of Germany. The Elbe Valley of Dresden was an internationally recognized site of cultural significance by the UNESCO World Heritage Committee for five years. After being placed on the list of endangered World Heritage Sites in 2006, the city had its status as world heritage site formally removed in June 2009, for the wilful breach of the UNESCO World Heritage Convention, due to the construction of a highway bridge across the valley within 2 km of the historic centre. It thereby became the first location ever in Europe to lose this status, and the second ever in the world. During the final months of World War II, Dresden became a safe haven to some 600,000 refugees, including women, children, and wounded soldiers, with a total population of 1.2 million. Dresden was attacked seven times between 1944 and 1945, and was occupied by the Red Army after German capitulation. Dresden has experienced dramatic changes since the reunification of Germany in the early 1990s. The city still bears many wounds from the bombing raids of 1945, but it has undergone significant reconstruction in recent decades. Restoration of the Dresden Frauenkirche was completed in 2005, a year before Dresden's 800th anniversary, notably by privately raised funds. The urban renewal process, which includes the reconstruction of the area around the Neumarkt square on which the Frauenkirche is situated, will continue for many decades, but public and government interest remains high, and there are numerous large projects underway—both historic reconstructions and modern plans—that will continue the city's recent architectural renaissance. Leipzig is, with a population of approx. 519,000, the largest city in the federal state of Saxony, Germany and in the new states of Germany. In the 17th century, Leipzig was one of the major European city-centers of learning and culture in fields such as music, astronomy and optics. After World War II, Leipzig became a major urban centre within the Communist German Democratic Republic. Leipzig later played a significant role in the fall of communism in Eastern Germany, through events taken place in and around St. Nikolai Church. Since the Reunification of Germany, Leipzig has undergone significant change with the restoration of historical buildings and the development of a modern transport infrastructure. In 2006, Leipzig hosted key games in the World Cup. 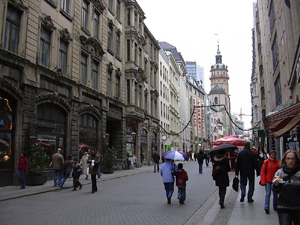 In 2010, Leipzig was ranked 68th in the world as a livable city, by consulting firm Mercer in their quality of life survey, scoring just below Atlanta, Georgia. In 2009, Leipzig was ranked 35th in the world out of 256 cities for cultural, economic and social innovation. 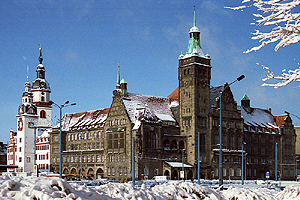 Chemnitz known from 1953 to 1990 as Karl-Marx-Stadt is the third-largest city of the Free State of Saxony, Germany. 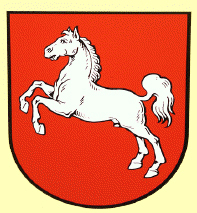 Chemnitz is an independent city which is not part of any county and seat of the government region Direktionsbezirk Chemnitz. Located in the northern foothills of the Ore Mountains, it is a part of the Saxon triangle metropolitan area comprising 3.5 million people. The city's economy is based on the service sector and manufacturing industry. The Chemnitz University of Technology has around 10,000 students and is the centre of scientific life. During World War II, Chemnitz included factories that produced military goods and a Flossenbürg forced labor subcamp (500 female inmates) for Astra-Werke AG. The oil refinery was a bombing target. The WWII bombings left most of the city in ruins and post-war, the East German reconstruction included large low rise (and later high-rise plattenbau) housing. Some tourist sites were reconstructed during the DDR era and after German reunification. After the reunification of Germany Saxony faced a significant population decrease. Since 1990 Chemnitz lost more than 20 percent of the inhabitants. In 2006 the BBC reported the city of Chemnitz had the lowest birth rate in the world. Schloss Moritzburg is a Baroque castle in the municipality of Moritzburg in the German state of Saxony, about 13 km (8 mi) northwest of the Saxon capital Dresden. 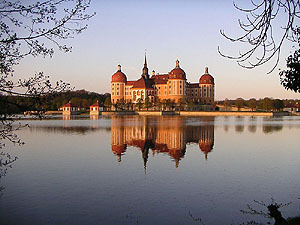 The original castle was built from 1542–1546 as a hunting lodge for Moritz of Wettin, then Duke of Saxony. Elector John George II of Saxony had it extended and between 1661 and 1671 the chapel was added after designs by his architect Wolf Caspar von Klengels, a fine example of the early Baroque style. After in 1697 John George's grandson Elector Frederick Augustus I had converted to Catholicism in order to secure his election as King of Poland, the chapel was consecrated in the Catholic rite. Between 1723 and 1733, Augustus had the castle largely remodelled as a pleasure seat by the architects Matthäus Daniel Pöppelmann and Zacharias Longuelune, including a formal park, several ponds and a game preserve. The last resident from the House of Wettin was Prince Ernst Heinrich of Saxony, dispossessed in 1945 by the Soviet Military Administration in Germany. In winter 1972/1973, the Baroque castle was the festive backdrop for “Three Hazelnuts for Cinderella” – one of the most popular German fairy-tale movies.